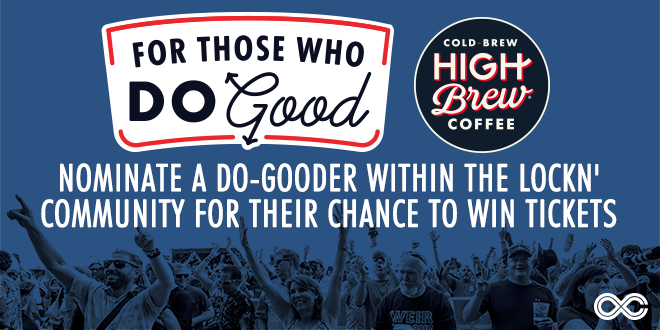 Nominate and Enter a Do-Gooder To Win Tickets! It’s time to nominate your unsung hero. Does he/she take the lead in “giving back” to the LOCKN’s tight-knit music community? We’re looking to honor those who enhance the lives of people around them, through selfless acts and community kindness. Nominations will be accepted starting today, Friday, May 12, through July 1, 2017. The top 10 nominees, determined by a nominating committee comprised of LOCKN’ and High Brew Coffee personnel, will be featured on LOCKN’s website and social media channels, where fans will vote for the final winner. High Brew Coffee is Cold Brew for those who do, and is made from Arabica beans that are cold-brewed over time, not heat. High Brew’s cold brew process creates twice the natural caffeine and less acidity than traditionally brewed coffee, for a taste that’s better, not bitter. Just like a good friend, High Brew Coffee always has your back, and is ready when you are! So people… Start nominating your awesome friends who’ve done thoughtful things.